A side impact collision is also know as a T-bone collision or a broadside collision, and involves one side of a vehicle being impacted by the rear or front of another vehicle. The reason some have referred to this collision as a T-bone collision is that the shape of the crash of the two cars actually forms the letter “T” in a side impact wreck. 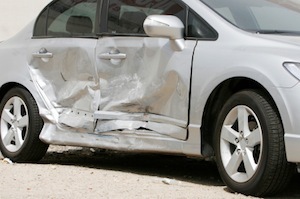 In a typical front-end collision, the motorist has several feet of metal, engine parts and glass to absorb and disperse the impact. However, in a side impact collision, only several inches separate the driver’s body from the point of impact, meaning there is less opportunity for the vehicle to absorb the energy of the crash. The side impact crash has the highest potential to cause life threatening injuries because these accidents typically occur on the driver or passenger side door and involve some sort of physical encroachment or intrusion into the passenger compartment of the vehicle. These factors make serious and life threatening injuries more commonplace in side-impact wrecks. Most fatalities from a side-impact crash are due to serious injuries to the brain or head. Not only can this occur from the strength of the impact alone, but also from the difference in size and height of the two vehicles involved in the crash. For example, the height differential between a sport utility vehicle (SUV) and a sports car is markedly different. In a side impact crash, the bumper of the SUV may actually be at the same height as the head of the motorist in the other vehicle. In such a scenario, there is little to protect the head and brain from a potential traumatic and fatal injury. It has been estimated that 25 percent of all car crashes involve a side impact collision. Of those collisions, roughly 27 percent involved passenger vehicle occupant deaths. Not surprisingly, automakers began in earnest to develop side impact air bags (SABs) in the late 1980s and early 1990s. The Insurance Institute for Highway Safety released a study in January of 2011 that showed vehicles equipped with side-impact air bags greatly reduced the risk of motorist death. INSERT http://www.iihs.org/news/rss/pr011911.html Further, SABs—which include head protection—can decrease fatalities by as much as 45 percent. Side impact crashes typically occur as the result of the failure to yield or obey a traffic control device. There are several scenarios that are common in the failure to yield category. Typically, side impact crashes occur as the result of one motorist failing to yield to another motorist while entering an intersection or making a turn. Further, many side impact wrecks happen due to one motorist failing to obey a stop sign or traffic control device. As a result, one vehicle collides into the side of another. Due to potential catastrophic injuries involved in a side impact collision, it is important to seek legal advice from a seasoned car accident attorney to determine your options under the law. The Law Offices of Kevin C. Ford has been handling side impact crashes and other vehicle collisions for nearly 20 years. To quickly determine your rights under the law, please contact an experienced personal injury attorney.